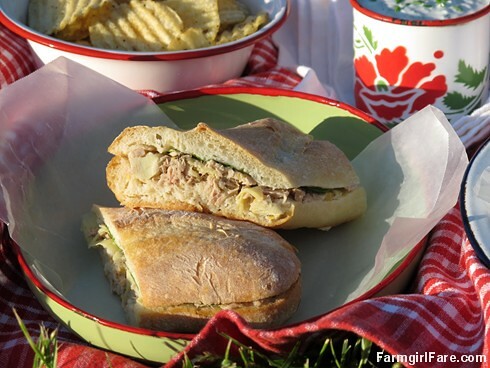 These Lemony Tuna and Artichoke Cooler-Pressed Sandwiches are my new favorite lunch—and they aren't just for picnics. Tuna packed in olive oil is combined with marinated artichoke hearts, lemon, and fresh basil on crusty baguettes for a scrumptious, no mayonnaise twist on tuna sandwiches. They're also the perfect way to celebrate the first homegrown basil of the season, especially if you don't have any ripe tomatoes yet. And if you really want to make your sandwiches special, you can bake your own baguettes using my easy recipe for Four Hour Classic French Baguettes. © FarmgirlFare.com, bonkers for basil, impatiently waiting for juicy, vine-ripened tomatoes. Grow, grow, grow. Yes! Tuna sammies are the best for summer! Thanks for the giveaway! sounds great! I love basil and never thought of adding it to tuna. I just found your blog. This year I purchased raised garden containers and I'm so excited to have a garden for the first time. I've had a difficult time finding information on the net without running into spammy type sites. I'm grateful I found your blog. Thank you for sharing!